In January 2007 the MCS Napoli, a huge ship loaded with nearly 2400 containers and 3500 tonnes of fuel, left Antwerp bound for South Africa. Battered by fierce gales in the English Channel, she started to break up and was run aground on Branscombe beach. Oiled sea-birds washed up on the pebbles; over a hundred containers slid off the listing ship. Some sank onto the sea-bed, others were thrown onto the beach. Some were torn open by the sea, others by treasure-seekers, both local and, as the media spread the news abroad, from far away. 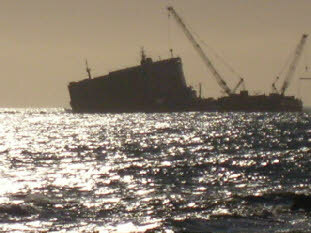 A massive clean-up got under way; the ship was eventually blown in half. Half of it was towed to Belfast, and two years later, in the summer of 2009 the last pieces were lifted from the sea-bed. Click here for an account of the village involvement in the story of the Napoli. Click here to buy the Napoli double DVD. To view the slideshow click on the control bar below the image. Move the pointer away from the image to hide the control bar or bring it back over the image to see the bar again. You can stop at a particular image by clicking on the bar or move the slides along manually.